before roads came to the sierra. The CCT travels through pines to oak forest, to cactus, to subtropical canyon floors many times. It weaves through areas essentially unknown except to the few Tarahumara families whose homesteads can be seen on isolated hillsides. 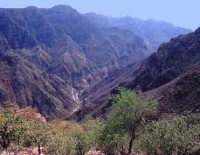 The CCT is for those who enjoy the Copper Canyon as it is, unpackaged, away from the well-known tourist areas. 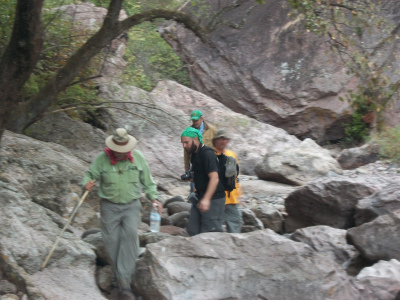 The Copper Canyon Trail Organization are people who seek wordless presence amidst the vast spectrum of wildlife, growing things, scenery and people of the scatterd ranchos of the Sierra Madre Ocidental. The CCT is their project. Much of the CCT consorts with relaively pristine country. To keep the quality of the countryside, the trail is outfitted with huts and inns along the way to accommodate trekkers. We got quite used to them and like them. The Copper Canyon Trail is only for experienced hikers and outdoor folks. The 36 mile Temoris to Chinipas section descends and ascends again and again through several eco zones. You go from ponderosa pines to oaks, to cactus, to parrots and boas. Elevations vary from 2000 feet to 6500 feet. It begins in the town of Temoris just off the Chepe Rail line, crosses the piney highlands, dips in and out of an unnamed canyon, skirts below the cliffs and descends to the sub tropical confluence of the Rio Monterde and the Rio Wa'Chajuri. Here the CCT follows the Chinipas river downstream to the old mining town of Chinipas. It is a strenuous 4 day trek . There are huts or inns to stay each night. The CCT is back country. Most of it is virtually unexplored by outsiders. It is very sparsely populated. Accordingly, the CCT is not for novices. It is considered both strenuous and hazardous. The CCT was created by mule drivers long ago. It is remains the same as it was then, and some arrieros still use it. It grew oganically rather than by plan. Somehow the trail found its own best way. It is unimproved. It is not given maintenance. In some places, there are trenches in the volcanic tuff scraped out by hooves over the centuries. In some stretches, it is loose rock on loose dirt, and in others it is propped up over drop-offs by horizontal logs backfilled with dirt and rock. River crossings are many, and sometimes delay us after a rain or snow upriver. The CCT ten year master plan is to connect the old trade routes from Guachochi to Batopilas, Urique, Cerochaui, Guazapares, Wa'Chajuri, and Chinipas. a total of 132 miles. The first section now open is the Temoris to Chinipas section detailed on this site. This site was created by those who enjoy the CCT again and again, and we welcome your additional information and photos.